All 10 current Democratic seats are in states that President Obama won in 2012 by at least five points, and only two of those states — Colorado and Nevada — are swing states in a competitive presidential election. Meanwhile, of the 24 states the Republicans are defending, Obama won seven in 2012: Florida, Illinois, Iowa, New Hampshire, Ohio, Pennsylvania, and Wisconsin. Additionally, Republicans are defending North Carolina, which Obama won in 2008 and only lost by two points in 2012. The most vulnerable Democratic senator going into 2016 is the party’s leader in the Senate, Sen. Harry Reid of Nevada. The unpopular Reid had a very difficult campaign in 2010, but he survived thanks to his hapless, foot-in-mouth opponent, Sharron Angle (R), and a tremendous ground operation. Assuming Reid runs again — indications are that he will but he could change his mind — we’re going to give him the benefit of the doubt and start the race as Leans Democratic. However, that will shift if Gov. Brian Sandoval (R-NV) decides to run. Sandoval is so formidable and popular that his entry into the race would make Reid an underdog. We would move the rating to Leans Republican. The other vulnerable Democrat is Sen. Michael Bennet of Colorado, and his race starts as Leans Democratic. Sen.-elect Cory Gardner (R) just won an impressive victory in the state’s other Senate seat versus outgoing Sen. Mark Udall (D), but despite running what was probably the best Senate campaign in the country, Gardner got less than 50% and won by just two points. There’s not a candidate as widely regarded as Gardner waiting in the wings to challenge Bennet. A GOP presidential win in the Centennial State is probably a prerequisite for a Senate win, and even then that might not be enough. 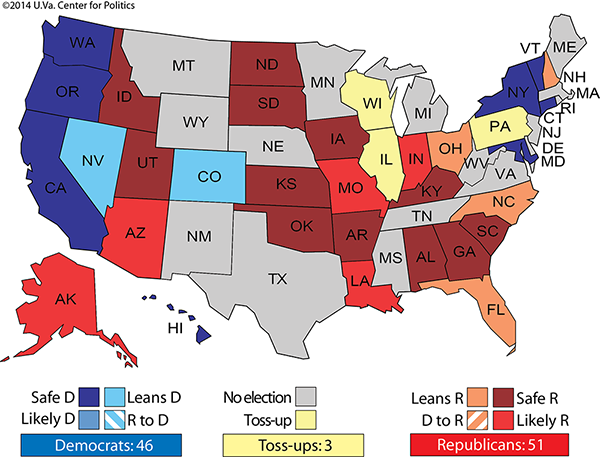 The most obvious Democratic Senate targets are three first-term Republicans elected from states that have all voted Democratic in at least the past six presidential elections: Sens. Mark Kirk of Illinois, Pat Toomey of Pennsylvania, and Ron Johnson of Wisconsin. These races start as Toss-ups. The next best Democratic targets are four Republicans who reside in states that are likely to be key pieces of the Electoral College map in 2016: Sens. Marco Rubio of Florida, Kelly Ayotte of New Hampshire, Richard Burr of North Carolina, and Rob Portman of Ohio. 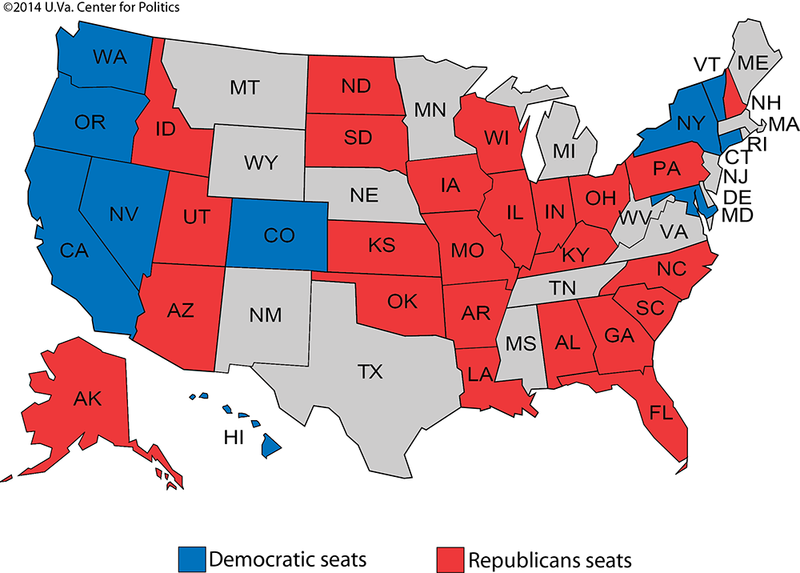 The remaining Republican seats up this year also start as safe: Alabama, Arkansas, Idaho, Kansas, North Dakota, Oklahoma, South Carolina, South Dakota, and Utah. We’ll save a look at potential primaries in these or other seats for another time. But because the Democrats need to net four or five seats to take control, depending on the party of the next vice president, the Democrats’ opening odds to win the majority are significantly less than 50-50. In order to capture the Senate, Democrats will have to put some currently leaning or likely Republican seats in play, along with winning their own seats and the three GOP-held Toss-ups. That’s certainly possible, but the GOP starts with a clear edge as the cycle begins. However, our opening assessment is that Democrats are well-positioned to end the cycle with more seats than they will hold starting in January (46, including the two independents who caucus with the Democrats).